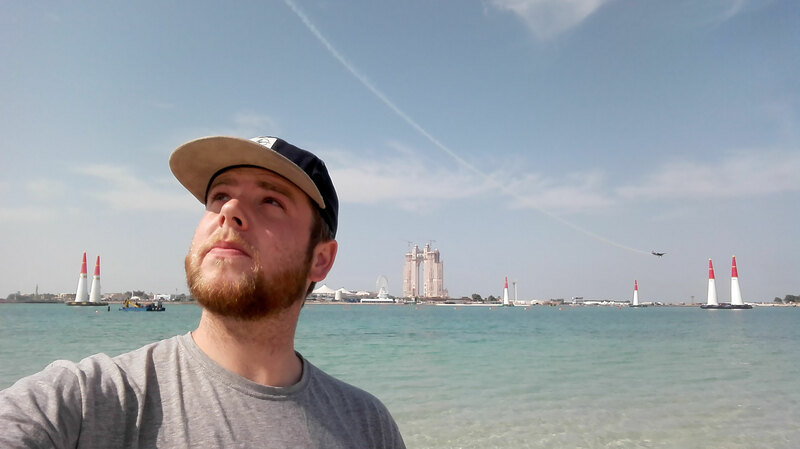 The past days here in the United Arab Emirates have been very cozy. Whether due to "bad weather" or my personal desire to relax, I took it slow. Through strong winds the air here is very sandy and also some rain has fallen here again. But I am very happy of the weather here. The ~ 30 ° are so comfortable to bear. And since I have really well befriended myself with my host Narek, I have not left Abu Dhabi once. There is of course much to discover here. Much of it bursts my small purse, but what I have experienced makes me very satisfied and I would not withhold you. It's perfect timing again for me to come here. 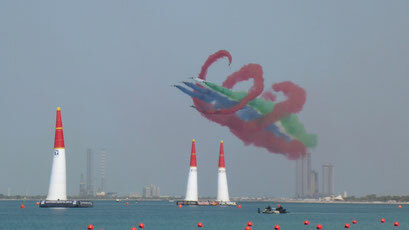 Once a year, Abu Dhabi is the scene of an extravagant spectacle. 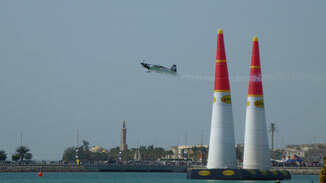 In one of the many artificial bays, the RedBull Air Race took place. Of course the good places can only be purchased through expensive tickets, but the city beach of Corniche offers a very wonderful view of the happenings. So Narek and I set out to take part in the spectacle. And it was truly impressive. When we arrived the flight show of various international groups was in full swing. Spectacular formations, breathtaking maneuvers and booming engines. Totally fascinating. This was followed by the race. Small artificial flying machines race through the course at impressive speed. You have to fly through the pylons. And of course, as fast as possible. We stood for a while at the sandy beach and enjoyed the insane talent and skill of the pilots to follow. After a while I have to stand but it was a bit monotonous, because of course all participants took the same course and of course we could not feel any difference in time. So we were waiting for another showdown from the rescue team, a crazy paraglider flew thousands of loops, and two wing suit artists flying with their wing suits in a formation over our heads before they opened their parachutes. Definitely worth seeing! On another day I went alone to visit the newest artificial island Saadiyat. Here a gigantic cultural center will emerge and I am somewhat disappointed that I could only experience this under construction. Among other great buildings and leisure facilities, a Guggenheim Museum and a Louvre are being built here. Two gigantic buildings with worn architecture. Just as it is for a museum of format. Unfortunately, however, there was still not much to be seen. My desire for art and culture served with something else. I went with one of the well-organized (but expensive) buses to the island of Al Mina. This is rather intended for logistical purposes as a port for cruise ships and fishing boats. Here is also a gigantic area of warehouses. And in storehouse number 421 is now an art museum. The residency of the Emirati artist collective "Warehouse421". With changing exhibitions by various artists, always accompanied by their own creations, they invite everyone to a creative adventure free of charge. Every Wednesday there are also workshops, but I was definitely interested in the visit. I did not really know what to expect here, I spent two very emotional hours in it and have come out with many experiences again. This was the most depressing exhibition I've ever visited. It was very good, but also very sad. 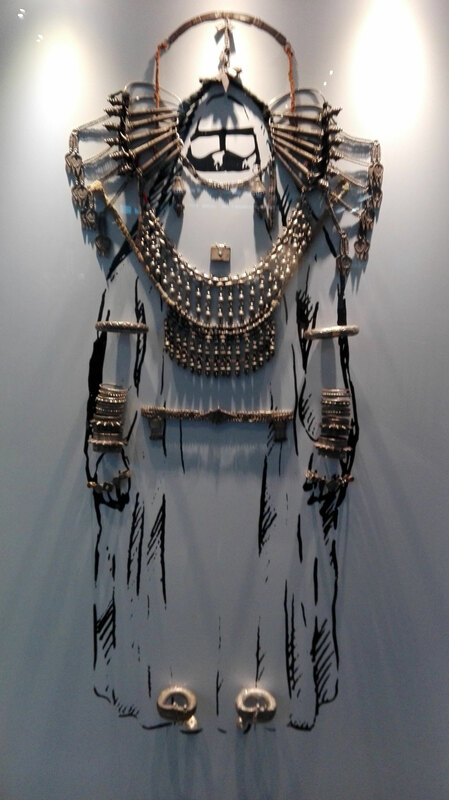 The exhibition is based on works of art made by the respective artist in honor of beloved deceased persons, artistic heirlooms or things that tell an intense story between the two persons. Every piece of the exhibition had to tell a heartbreaking story. It was very impressive and through the many stories and partly interactive exhibits, it was an excellent and blatant remedy to learn about the traditions and cultural background of the Emirati. Partially told through various media, partly by the artists personally. It was very good, but also emotionally very demanding and not easy. I highly recommend it. Of course, it is natural that I then longed for some fun. So I went on another day to the island of Yas. This artificial island is the fun center of the city. But here are not just some bars and party areas, no. The world's largest covered leisure park and a gigantic water fun park are also here. Right next to another, exaggerated large, shopping center. 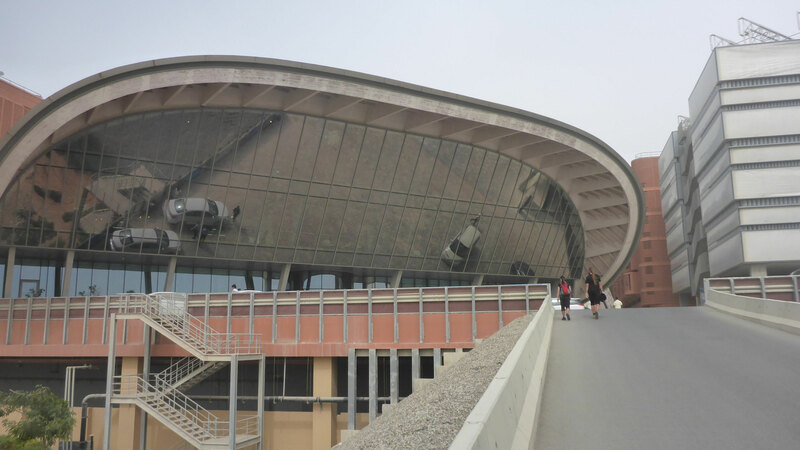 The leisure park, the Ferrari World, captivates with its grand design and architecture. In the corporate design of Ferrari, the roof extends in typical streamlined vaults over 80,000sqm. And the 20 rides in it, of course, revolve around the fast driving with a Ferrari. Clearly, especially to find new buyers here. Unfortunately, the pleasure was too expensive (~ 70 €). But I would have liked to try the fastest roller coaster of the world (240km / h). Also the water park, which is even more expensive, I left behind and I rather meet in the luxury port of the island with Narek. Already in advance, we have registered for a free, extraordinary experience. 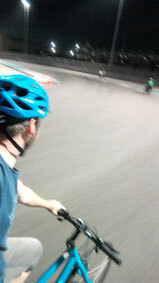 On the island is also Abu Dhabi’s Formula 1 race track and every Sunday and Tuesday it’s open for pedestrians and cyclists. In the very well-organization we were able to borrow free bikes and off we went on the race track. A cool experience. So cool, that I went there a week later again. Due to Narek, I also got the honor of getting to know Maria and Rafael. 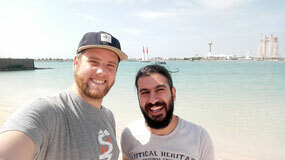 The two Armenians have lived in Abu Dhabi for 5 years. And they were kind enough to show me another side of the Emirates. 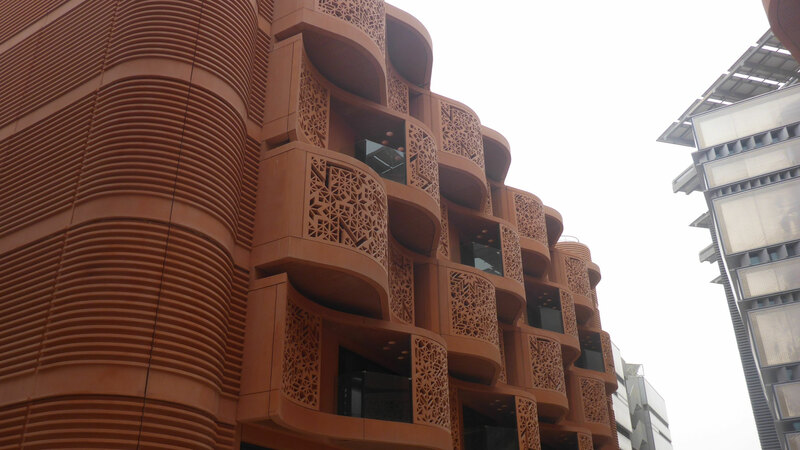 Maria is studying in Masdar City, a gigantic planned eco-city in Abu Dhabi. The aim of the program is to build an energy-efficient, climate-free, waste-free district for ~ 50,000 inhabitants and 1,500 companies. 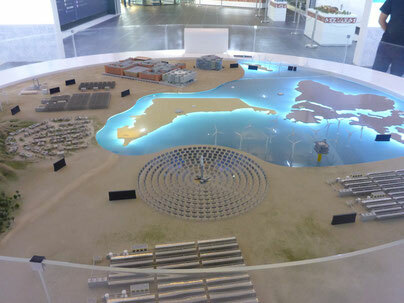 This is to be ensured by solar-driven desalination plants and a mix of various renewable energies and energy concepts. Per capita, energy consumption should be reduced to 25% of today's level. Among other things, every street in the city is to be given access to public transport within 200m and there are self-piloted cars on the road. Yes, they are going today. Select the destination and off you go. Well, there are so far only two stations, which makes the goal choice superfluous, but by 2025 the project is planned to be completed. In addition, a gigantic research complex of universities and companies is integrated into the topic of sustainability. Also here is the headquarters of the "International Organization for Renewable Energies" in which 149 countries are active. Ironically, the falling oil prices have stopped the construction of this cost-intensive, gigantic project. The government, which was so proud of this project, has once turned the money tap. Well ... I mean the research in the direction should not be luxury, which only should be supported when the money bubbles. But what do I know? The most beautiful stories are written by chance. Who would have thought that I could take the following experience with me? Not me. I have met the Melissa (USA) and her Canadian friends here in Abu Dhabi. And, like real Canadians, they promptly invited me to an ice hockey game. 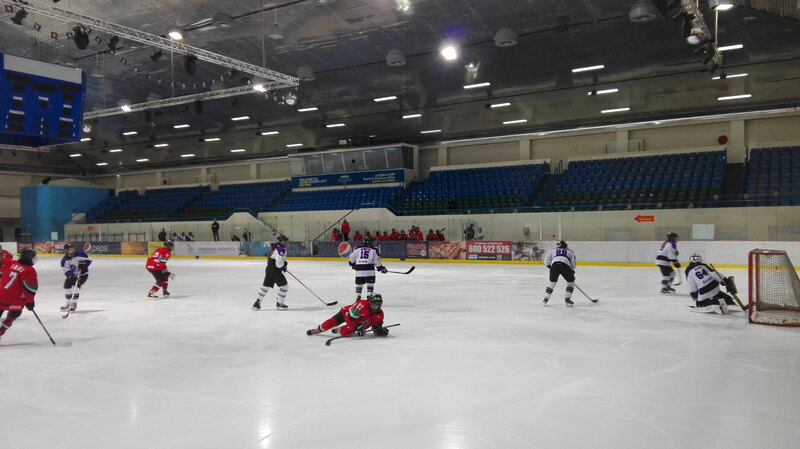 I have never seen a professional ice hockey game, so my first contact with it should be in the Arabian desert. 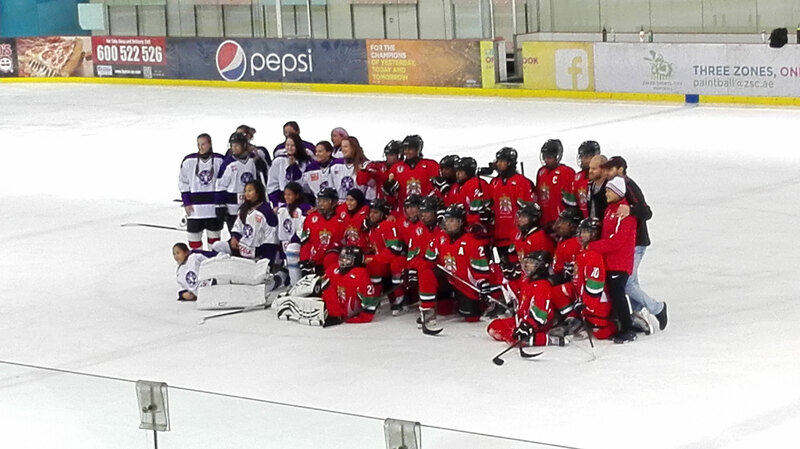 It is also a game of the women's national team against the ladies of Abu Dhabi. Only a few years ago, this sport was allowed for women and so I could experience almost a piece of history of emancipation live. 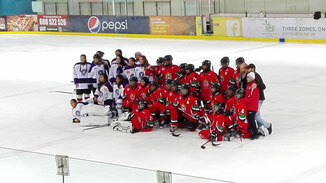 So I visited an ice hockey game of women in the Arabian desert. I could not imagine such an experience before, these things just happen. 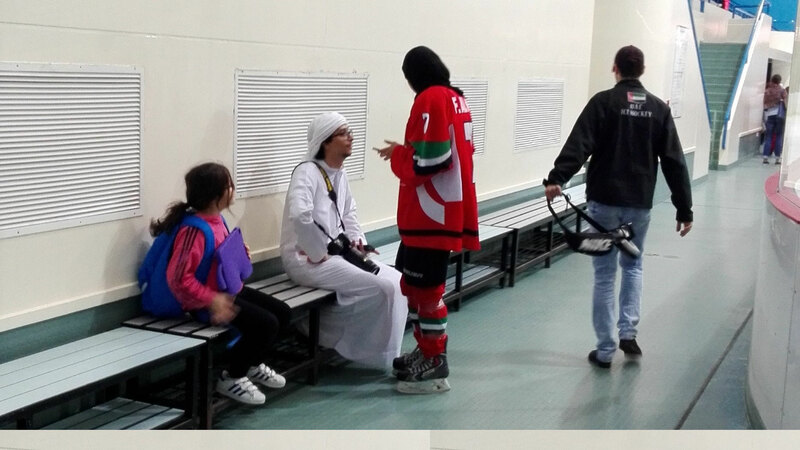 Of course, because of the madness of visiting an ice rink in the desert I did not feel particularly comfortable, but it was great besides that. And the Canadians have given me of course details about ice hockey. Learned something again. Bravo! Otherwise, I spent a lot of time with Narek. We have debated and philosophized a lot. So one night we compared the constitutions of our home countries, which was of course very exciting. But we also shared less important things and the chocolates of life. So Narek has bought a remote helicopter, which of course we have extensively used ... until we finally broke it. 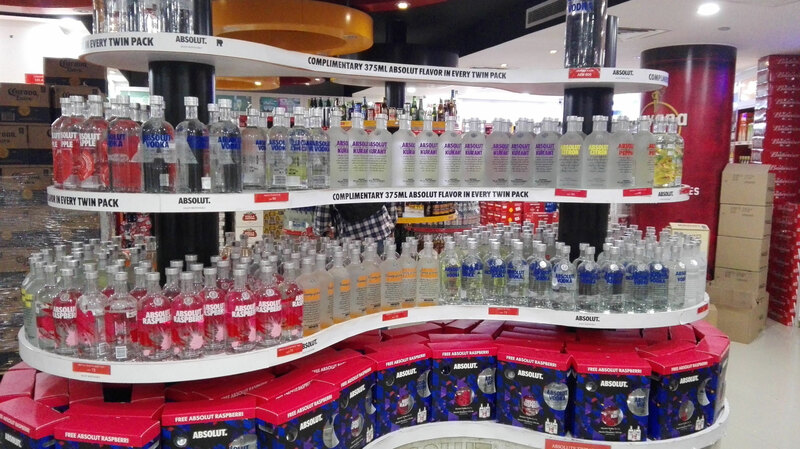 So we compensated our frustration with a visit to the rare alcohol shops. It needs a special license for non-Muslims to buy or transport alcohol. And only hotels and / or bars can serve those. To drink in public is, of course, a no go. 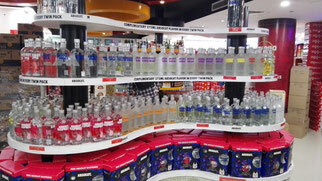 Drunkenness even without alcohol on the body, is punished and is unsettled. We made small errands in the Baqala around the corner. Hundreds of these small kiosks are scattered everywhere. It is also common that one sees large cars from Emiratis driving there. However, they rarely do. They honk and are operated in the vehicle. But to be honest, I have learned to appreciate the Emirati over time. They offer many people the opportunity to build a life and treat people fairly. As long as you play by their rules (which, of course, have a few drastic principles compared to the West), they are very friendly, generous and fair. I am now on a small road trip through the Emirates. The next report tells you how this is going. - Around the corner, in Narek's district, is the purpose-built, most inclinated building in the world. With 18 ° inclination it is to represent a counterpart to the tallest building in Dubai. By way of comparison: the tower in Pisa has only 4 ° inclination. - Cars are incredibly cheap to purchase. However the maintenance is very expensive here. Not the gasoline, but every service here is expensive. - And it's going to be fierce. 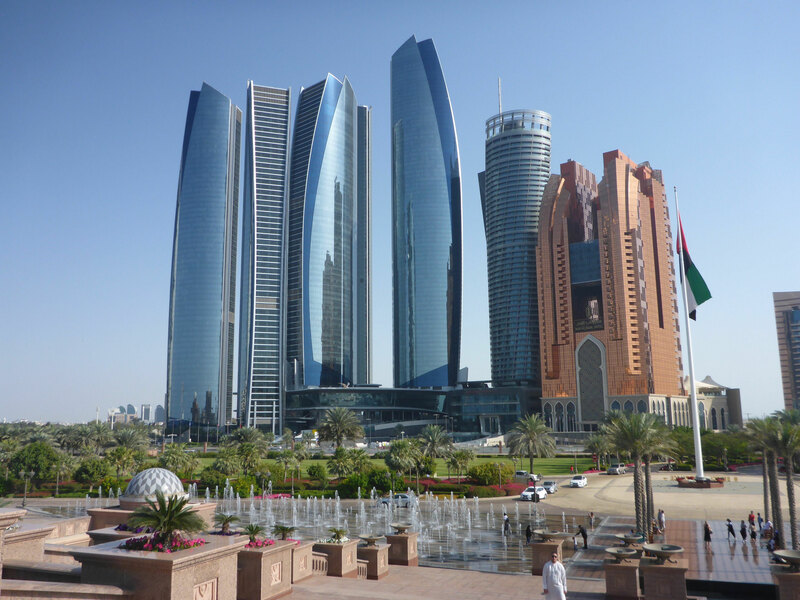 New islands and skyscrapers are also being built in Abu Dhabi. For example, the famous Marina Bay Sands hotel from Singapore is replicated here 1: 1. Including the gigantic pool and park on the roof, which connects 3 buildings. - In the gigantic mall around the corner, the Mushrif Mall, one of the enormous LuLu hypermarkets (like supermarket just "hyper"). In this one there are 30 full cash registers! - The Emirati have a lot of money and lots of space. And so they also build their cities. 12 lane roads cross the desert. And because of the distances here even the delivery services have motorcycles instead of scooters. - In an eco-shop we have discovered the hidden department for non-Muslims. Here you can also buy pork or products that contain pig products. However, this may not be shown publicly. And must be paid separately behind closed doors.